Fra Angelico (Florentine painter, c. 1400-1455), "Jesus Appearing to the Magdalene" (Noli me tangere, 1440-41). fresco, 180 x 146 cm; Cell 1, Convent of San Marco, Florence. Larger image. It was like a violent storm had gone through leaving destruction in its wake. But early this Sunday morning all is quiet — the lull after the storm — or so it seems to Mary. But I'm getting ahead of myself. Let me tell you the story. First, there is Jesus, the leader and prophet from Galilee. When his popularity was at its apex in Jerusalem just the week before, many had considered him the Messiah. But on Friday, his enemies had succeeded executing him by crucifixion. There are soldiers guarding his tomb. Why? His enemies had heard a report that Jesus was supposed to "rise again" on the third day. Preposterous, his enemies said, but they could take no chances. If there were a guard — especially a Roman guard — his disciples wouldn't dare steal the body and claim he'd been raised. Keep a lid on any stories that might re-enflame the populace — that was the plan. In the moist, bone-chilling darkness, the soldiers huddle around a sputtering fire that flickers ghostly images amidst the shadows of tombs. They're not afraid, mind you, just ill at ease, anxious for the dawn that will soon brighten the horizon. Jesus' disciples figure in the story, too, but they are afraid — terrified that they too will be arrested because of their close association with Jesus. They're in hiding within the city. "No worries from them now," their enemies smirk. Crowds of pilgrims that had swelled Jerusalem to the bursting point over the Passover weekend have gone home now, back to their villages, bearing a disquieting story of how the Galilean healer had been killed. They are still angry, of course, but the danger of riot over the Nazarene's trial and execution is past. That's how things stood just before dawn. Sad, tragic. So much hope, so much promise. But now it had come to nothing. A movement so full exuberance had been crushed — its famous leader cut down, its lieutenants in hiding, its followers scattered. But after the storm, life must go on. And now we meet Mary Magdalene. She has been one of the Nazarene's most devoted followers. She and some of the women have risen very early to honor the teacher's body and are headed for the garden tomb just outside the city walls. Within the sepulcher he lies, cold and lifeless on a rock slab. Mary Magdalene had been there Friday night. Her own hands had helped wash and prepare the body. The women turn from the lane into the cemetery garden, walking numbly, one foot in front of the other. Suddenly Mary looks up and shouts: "The stone has been moved!" She runs into the garden, past remnants of a smoky fire, soldiers' equipment in disarray, abandoned in haste. She sprints to the now-open tomb. The ribbon and Roman seal that have guaranteed its security hang limply in the morning air. "Where is he?" she shrieks, and ducks inside. The darkness of the tomb and the concrete-like odor of fresh-cut limestone at the back of her mouth overwhelm her for a moment. As her eyes adjust, there on a shelf chiseled from the wall of the cave, she can make out grave clothes, neatly folded. But where is Jesus? Grave-robbers! Out in a flash, she begins to run back into the city. "I'll tell Peter and John," she calls as she speeds on. In a few moments, the disciple-women will see an angel who tells them, "He is risen!" But by now, Mary is back in Jerusalem. She pauses for a moment at the head of the street where the disciples are staying. Hands on her legs, heaving, trying to catch her breath. Now she pounds on the door. After a long pause, the disciple who, until recently, everyone acknowledged as the leader, opens the door a crack, looks up the street, then down it. Finally, he motions Mary inside and quickly shuts the door. "Somebody has taken his body out of the tomb! We can't find him!" Now Peter and John are in panic mode. They pull on tunics and sandals and dash towards the cemetery. Mary follows. Slowly now, head down, she walks and weeps. By the time she arrives back at the tomb, Peter and John have come and gone. The women are nowhere to be seen. She pauses by the door for a long moment, weeping uncontrollably. Then she gathers herself and steps into the cold chamber. The sun is rising now, casting long shadows across the garden. But this time, the tomb seems lit, also. Two men in bright white, dressed in long robes that extend down to their feet, rise as she enters. She sobs out her story. "They have taken my Lord away, and I don't know where they have put him." She dissolves into tears. When she looks up the men are gone. She turns. There, the sun silhouetting him in the doorway, is yet another man — the gardener, she supposes. Perhaps he'll know. "Why are you crying?" he asks quietly. "Who are you looking for?" She begins her sad tale for a third time, of grave robbers who have desecrated the tomb and of the teacher who had healed her and restored her very life to wholeness. "If you have taken him," she pleads, "tell me where his body is and I'll see that it is retrieved. There'll be no trouble." "Mary!" The voice so familiar. She looks up in sudden recognition. "Rabbi!" she cries and falls at his feet. It is Jesus. It is the Lord. He is not dead. He is risen from the grave. He is alive. He is resurrected as he had said. The storm has passed and the sun has broken through the clouds into a new day. What does it mean? What did it mean to Mary? First, her discredited Lord no longer lay in shame. He had been authenticated by God himself who had raised him from the dead. With his lifeless body in the tomb, confusing doubts had come. But now, everything he had taught took on new meaning. She actually was forgiven by God. He would return. It was all true. True indeed! Jesus stayed with them on and off for more than a month. Then one day he ascended into heaven. But his Spirit lingered and spread. Over the next few years, Mary would watch the Christian movement grow in spurts, from 100 to 3,000 in a single day. Then to 5,000 men — more than a fifth of the Jerusalem's entire population. Persecution came, but instead of snuffing out this story of the resurrection of the Son of God, persecution caused it to spread all the more. The movement raced like wildfire to the farthest reaches of the world. He is alive! Jesus is alive. Untold millions call him Lord. 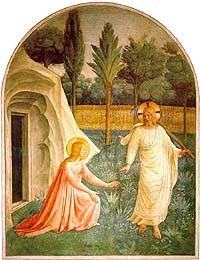 Now old, facing her own impending death, Mary realizes one more thing that the resurrection means to her. That day in the garden as she knelt before him, she had touched his pierced feet — no longer cold in her hands as they had been that terrible Friday night when she had washed them. Now they were warm, alive. Yes, death will come soon, but she no longer fears it. For she has touched the One who has conquered death. And in her final minutes she smiles and says — just loud enough for those close by to hear — "Death, where is your terror? He is risen from the dead!" Her eyes close for the last time. The sun is shining very brightly indeed. My reconstruction of this story is fictional, of course, though the events recounted (except Mary's deathbed words) actually took place. I have tried to harmonize John's account with those of the other Gospel writers as suggested by George Eldon Ladd (I Believe in the Resurrection (Eerdmans, 1975), pp. 91-93). But, of course, no one knows for sure the exact sequence of events. A deeper study of the resurrection can be found in my free, 5-week Bible study "Resurrection and Easter Faith" (www.jesuswalk.com/resurrection/).